The Sandhill Crane Wet Prairie is the only one of the planted prairies that was not an agricultural field. Thus, it is not part of our Conservation Reserve Program grant. The area that is now the Crane Prairie is a long narrow strip of land, about 3 acres, between Pleasant Valley Road and the wetland. It begins on the east near the privy and extends all the way to County Highway F. It was cropland at the time of the 1937 air photo, and continued to be cropped through 1955. It appears fallow in the 1962 air photo and remained untouched after that time. By the time we purchased the property in 1980, some areas were still open but there were scattered trees. Also, there were numerous honeysuckle bushes, some rather large. During the years up until restoration on this prairie began, it gradually filled in with invasive trees and more honeysuckle. By 1998, the area had become completely wooded and it was impossible to see the wetland from Pleasant Valley Road. This area had always been an eyesore to us, especially since it was so close to our barn and field station. Every time we looked down the hill from the top of the ridge we saw all the exotica. The brush was predominantly honeysuckle and the trees were box elder, slippery elm, black walnut, and black cherry. In addition to the undesirable vegetation, this strip was being used by locals as a dumping ground for bottles, cans, and sundry trash. 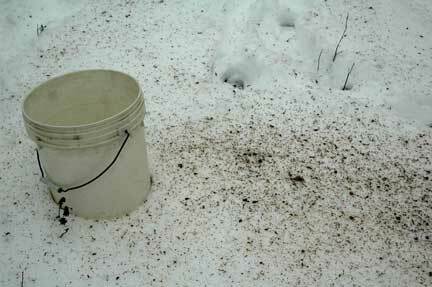 Also, every winter a new load of horse manure from some unknown source appeared, usually after a snowfall. Strangely, mixed in with this trash was a very fine stand of showy orchis (Galearis spectabilis). Clearing the Marsh Edge. We originally called this the Marsh Edge. Some winter clearing had been done when the snows were too heavy for work on the south slope, but serious clearing did not begin until January 2005. It took the Michler/Brown crew all of January and part of February on this job. A large number of trees were cut, and we ended up with 75 burn piles, all of which were burned while there was still snow on the ground. Originally the trees were cut about 3-4 feet off the ground. In early spring, when the snow was almost gone, the crew returned and recut these stumps as flush to the ground as possible. The goal here was to make it possible to drive tractors and sprayers across the area so that it could be prepped for planting. 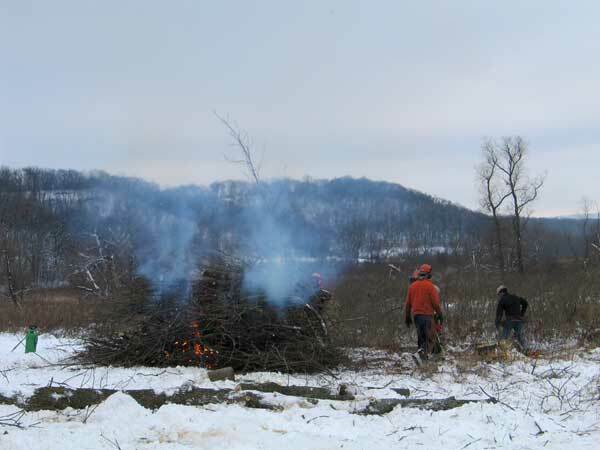 Clearing the Crane Prairie in January 2005. Seventy five separate brush piles were created and burned on the snow. Clearing occurred up to the boundary with the wetland itself, which is visible in the background. View toward Pleasant Valley Road. The final habitat ranges from wet through wet-mesic to dry-mesic on the road cut itself. The road cut was treated as part of the prairie and was planted. The south-facing slope with its prairie/savanna is visible in the background. Getting rid of all the large logs was a tricky task. Fortunately, early February was cold and snowy, making it possible for a neighbor with a Bobcat (small front-end loader) to reach the area. 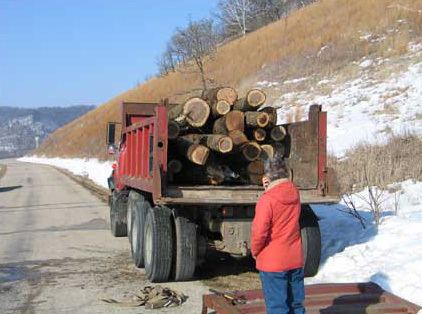 It took many trips from Pleasant Valley Road to the Marsh Edge to remove the trees. Because of the very cold weather, there was little damage to the soil. 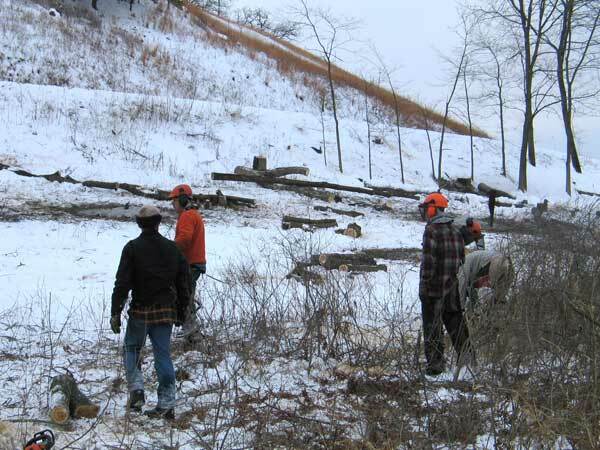 Because of the good cold weather, we were able to use heavy equipment to remove sawed logs during our marsh edge clearing. A neighbor was happy to take all the firewood we could give him. A load of walnut removed during our marsh edge clearing, destined to be fire wood. Unfortunately, about mid-February we had a thaw and further removal of trees ceased. 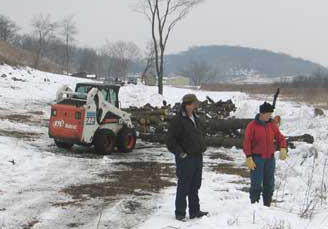 The neighbor was able to move all the downed trees to the east end of the site before the thaw, where they could be reached by tractor in the summer. Most of the remaining logs were removed the summer of 2005, but a few still remain, even today, right near the privy. These are now being left to provide wildlife habitat. In early summer the whole site above the original lane was sprayed with glyphosate, except for a few areas where "good" plants were visible. Closer to County F, there was a a large patch of wild parsnip which extended right up to the sedge meadow, so this was also sprayed. Spraying was done by Paul Michler using a hand-held boom sprayer working from the back of his pickup truck. (I drove the truck.) Walking with the boom, Paul walked vertically between the lane and Pleasant Valley Road, getting good coverage throughout. Later in the summer, the area was sprayed again, this time using a Fimco sprayer installed in our Kawasaki Mule. Since the herbaceous vegetation was fairly sparse, there was insufficient fuel to carry out a burn. Mostly, the site was open with lots of bare ground, suitable for hand planting. Planting the Marsh Edge (Crane Prairie). In December 2005 the prairie was planted. 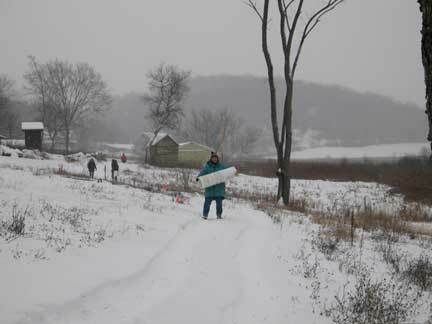 Since we knew we were going to plant a wet to wet-mesic prairie in the winter, we made sure during our seed collecting that we had plenty of appropriate species. Seeds were collected from the sedge meadow, wet areas in the Valley, Pocket, and Barn Prairies, and along Pleasant Valley Creek. All the seeds were cleaned and dried in our regular manner. The seed mixes had over 100 species, including substantial amounts of Indian grass. 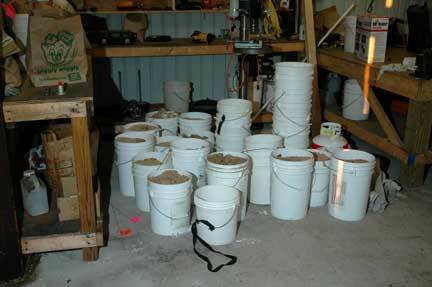 They were then mixed with sawdust and placed in buckets (see photos). I had measured off the area using a hand-held GPS, and had marked equal area sectors. Planting was done by a group of volunteers; each was assigned a sector. A light snow had fallen and was continuing a bit while we were planting. With the snow it was easy to see what areas had been planted and how well the seeds were distributed. 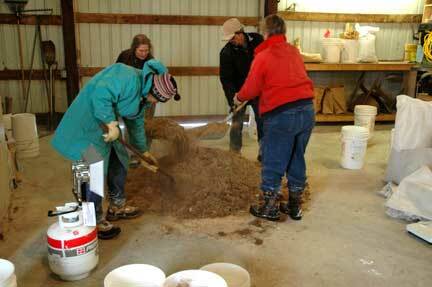 The seeds were mixed in the barn. Sawdust from a local sawmill was added as a carrier. The buckets of seed ready for planting. 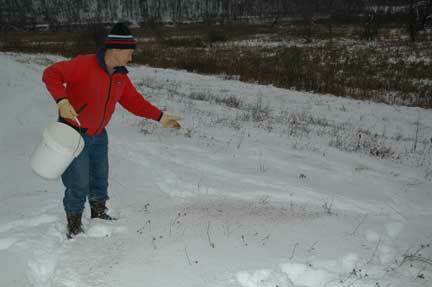 Planting the Crane Prairie on top of about 2 inches of snow, early December 2005. Seeds on the snow. Most of the material seen is sawdust. Back to the barn for some refreshments after planting the Crane Prairie. The single cherry tree was left but will probably eventually be cut or will die on its own from burns. 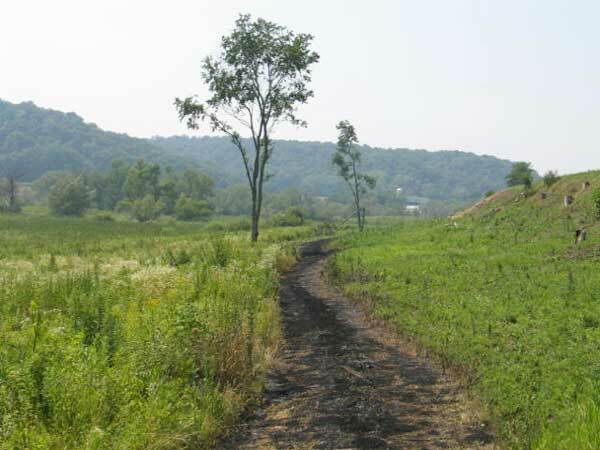 The lane visible here was later removed and a new lane/fire break created along the edge of the sedge meadow (the area with heavier vegetation in the background). Management after planting. 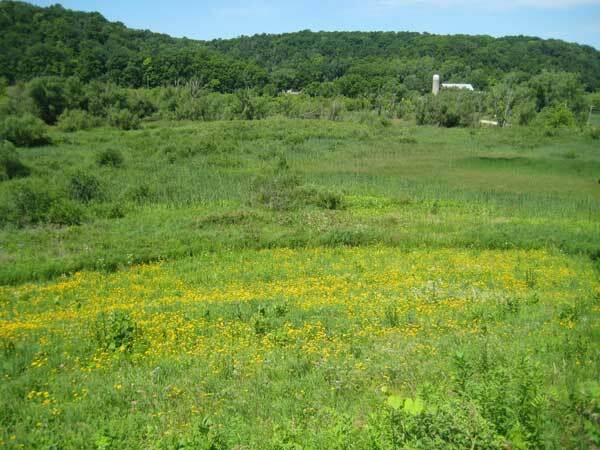 The summer of 2006, the first growing season, the Crane Prairie was mostly a weed patch. Lots of annual weeds had taken over. However, we could also see small prairie plants, including some relatively easy to recognize such as prairie dock, compass plant, wild indigo, black-eyed Susan, etc. In order to keep the annual weeds from setting seed, the whole prairie was mowed twice, using a "bush hog" that operates from the three-point hitch of our Kubota tractor. The height of the mower was set high so that the tiny prairie plants were not cut. The Crane Prairie in July 2006. The lane in the center had been treated with Roundup in June and burned off after it browned up. 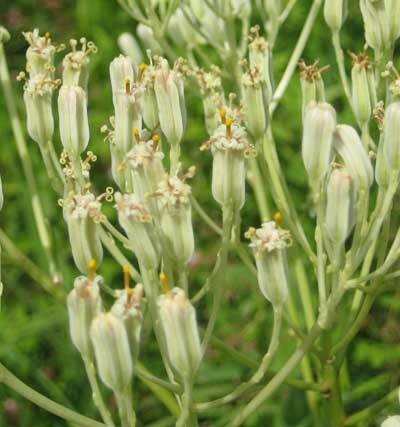 It was then planted with a seed mixture similar to that used on the rest of the prairie. Shortly after this photo was taken, the prairie was mowed. In spring/summer of 2007, the second growing season, the prairie was not mowed, but allowed to develop. Walks through the prairie in mid-May revealed lots of "good" plants, and by mid-summer we had substantial amounts of many prairie species. However, there were still lots of weeds, not the relatively unimportant annuals, but the more persistent biannuals and perennials. Weeds that had to be dealt with included white sweet clove, mullein,wild parsnip, hedge parsley, and several bad thistles. These were all hand pulled or dug with shovels. Passes through the prairie were made at weekly intervals up until the middle of August. We also had a rather extensive development of fleabanes. Daisy fleabane (Erigeron strigosus) is a very weedy annual that is relatively innocuous. Another fleabane, Erigeron philadelphicus, a biennial, is also not persistent. For some reason, these fleabanes mostly developed at the north end of the site. We did see many "good" species in flower, including pale purple coneflower, black-eyed Susan, bergamot, horsemint, yellow coneflower, rosin weed, and cup plant. The good rains of August probably played an important role in helping some of the late-flowering species. Those that really flourished included gaura, pasture thistle, swamp thistle, New England aster, and brown-eyed Susan. Grasses that grew well included Kalm's brome, Virginia wild rye, and Indian grass. Although still in their early development stages, compass plant and prairie dock were seen throughout. The photo below gives an idea of the Crane Prairie development in late August 2007. 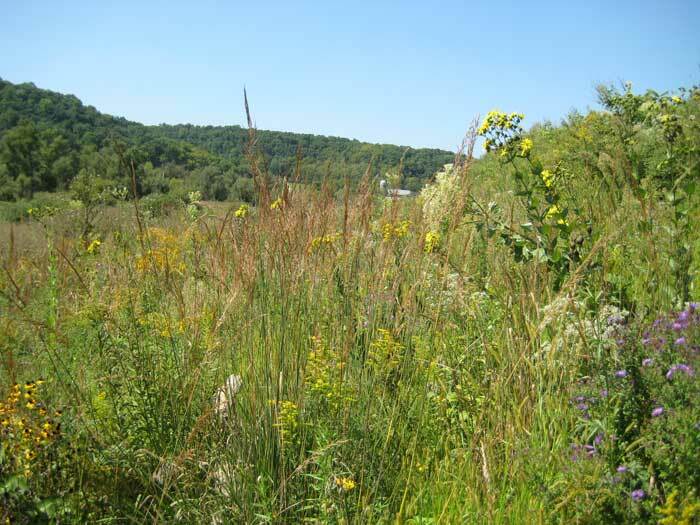 In our ten years of restoration work, we had previously planted five prairies. Each has developed in a different way, but none has been as good in its second growing season as the Crane Prairie. Perhaps we are getting better at managing these restorations, but another possibility is that the conditions here in this predominantly wet mesic habitat are very suitable for prairie species to thrive. 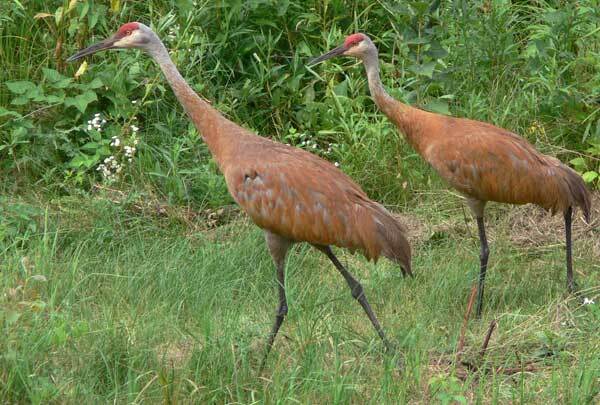 The Sandhill Crane Prairie has been well named (see Chris Noll photo below). We have seen sandhill cranes frequently on this prairie all summer. Because it is so close to the sedge meadow/cattail area where the cranes nest, it is obviously an attractive area to them. Although the Crane Prairie had a lot of "good" species in its second growing season, it also had a lot of exotic grasses such as smooth brome and bluegrass. These are called "cool season" because they develop early in the season, in contrast to the "warm season" prairie grasses. Although burning and overplanting may eventually reduce the presence of these grasses, this may take many years. In order to speed up this process, we employed the early spring glyphosate treatment technique that we had used successfully in the Barn Prairie and Valley Prairie. 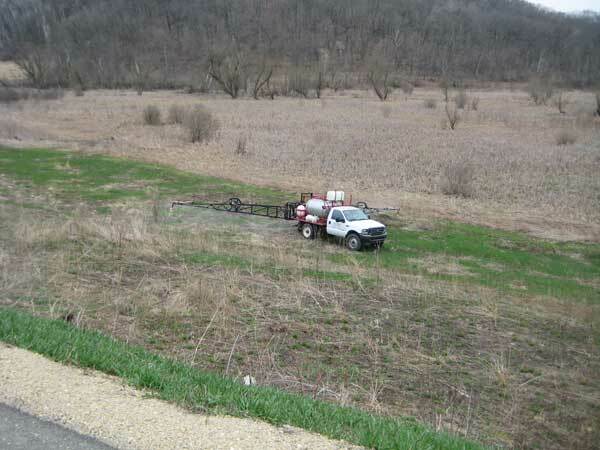 Spraying was done in early spring, after the exotic grasses were up but before any prairie plants were visible. Although a few species of forbs may get set back by this technique, they are not eliminated and will develop normally in subsequent years. The photo below shows the spray rig in action. Note all the green (cool season) grass, especially in the area near the wetland. Within two weeks after spraying this grass was all dead, whereas the warm season grasses were just showing above ground. Control of smooth brome in the Crane Prairie with this early spraying was excellent, and control of exotic weeds such as sweet clover, hedge parsley, wild parnip, and mullein by hand pulling went well. The table gives a species check list through the end of the third growing season: 87 species. Prescribed burn in the Crane Prairie, April 2009. 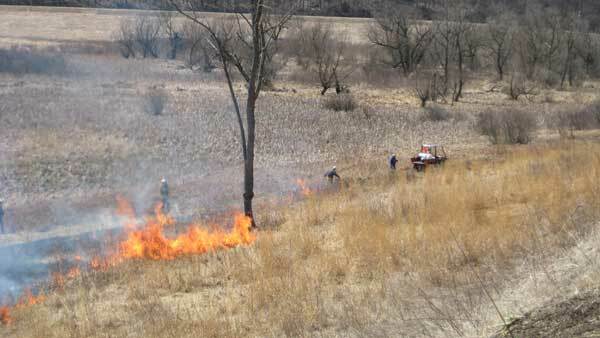 The burn crew had no trouble confining the fire to the prairie itself. The wetland (in the background) remained unaffected. The photo above shows the Crane Prairie in the middle of its fourth growing season. Both forbs and grasses are doing well. The closer to the wetland, the wetter the habitat and the more wet or wet-mesic species are found. The gradient from the wetland to the town road provides a wide range of habitats. The Crane Prairie has also proved an excellent site for transplants of wet-mesic and wet species. Among others, Prairie Indian plantain (Arnoglossum plantagineum, formerly called Cacalis tuberosa) a State Threatened Species, has grown quite well in the zone near the fire break, both from transplants and from seed.